In a move that is long overdue, veteran defenseman Wade Redden has been named the sixth captain in the history of the New York Rangers Hartford affiliation, first with the Wolf Pack and now with the Whale. Head Coach Ken Gernander was the teams first captain for the Wolf Pack’s first eight seasons in existence, He was succeeded after he retired and became a coach by Craig Weller. Weller was followed Andrew Hutchinson, then Greg Moore and the last captain was Dane Byers. The hasn’t had a captain since Byers was traded by the parent New York Rangers to the Columbus Blue Jackets on November 10, 2010 for Chad Kolarik. Since Redden was demoted to the AHL mostly for salary cap reasons and the fact that it wasn’t working out as either he or the Rangers had hoped for, the 34-year old from Lloydminster, Saskatchewan has been the paramount of class in virtually every way. From his dealings and availability to the team, to his coaches and to the media and to the fans. He has played well and works hard and has taken to tutoring all of the younger players on what it takes to play in the National Hockey League. Ask Michael Del Zotto, Stu Bickel or Ryan McDonagh or ANY of the players on the team right now and they will tell you how much of a help he has been to them. Any of them would tell you about his work ethic. His leadership and the professionalism in the way that he’s conducted himself. In terms of his cooperation with the media, he is always available to talk and to share his thoughts and he certainly has a world of patience with the human side of reporting. This couldn’t happen to a better or more deserving person. Given Redden’s contract status he’s likely to be here for a couple more seasons. Reaction from some of his teammates came out on Twitter just after they were told. 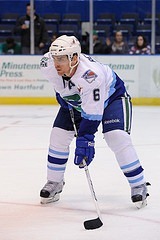 Connecticut Whale general manager Jim Schoenfeld announced today that defenseman Wade Redden has been named captain of the Whale. Redden, a 15th-year veteran who is in his second season with the Whale, and has 994 games of NHL experience in his career, is the sixth player to wear the captain’s “C” in franchise history. He follows current Whale head coach Ken Gernander, who captained the squad for its first eight seasons in Hartford, Craig Weller, Andrew Hutchinson, Greg Moore and Dane Byers. The Whale has gone without a captain since Byers was traded by the parent New York Rangers to the Columbus Blue Jackets November 10, 2010. Redden’s first game as Whale captain will be tomorrow, Sunday, March 4, when Connecticut visits Manchester to take on the Monarchs. Faceoff is 3:00 PM, and all the “Rockin’ Hockey” action can be heard live on “The Rock” 106.9 WCCC-FM. The Whale are next on home ice at the XL Center this Friday night, March 9, in a GEICO Connecticut Cup game vs. the Bridgeport Sound Tigers. That game faces off at 7:00 PM, and fans can take advantage of a special food combo at every remaining Whale Friday home game, as a hot dog and a 12-ounce soda is only $5. Tickets to all 2011-12 Whale home games are on sale now at the Public Power Ticket Office at the XL Center, as well as on-line at http://www.ctwhale.com and through TicketMaster Charge-by-phone at 1-800-745-3000. Save on your tickets, and get the best seats, with a ticket plan for the Whale’s 2011-12 AHL campaign, which are on sale now. For information on season seats and mini plans, visit http://www.ctwhale.com, or call the CT Whale ticket office at (860) 728-3366 to talk with an account executive today. The AHL’s Connecticut Whale is operated by Whalers Sports and Entertainment, a Hartford-based sports marketing and event firm founded by Howard Baldwin and Howard Baldwin, Jr.. The team is the top player-development affiliate of the NHL’s New York Rangers. Since 1972, the CT Lottery has generated nearly $21.4 billion in sales and has transferred more than $7.2 billion to the state’s General Fund. Prizes have exceeded $12.3 billion. Purchasers must be 18 years or older. If you or someone you know has a gambling problem, call the Problem Gambling Helpline at 1-800-346-6238. For more information about the Connecticut Lottery Corporation, visit ctlottery.org. This entry was posted in AHL, Connecticut Whale, CTWhale, Hockey, New York Rangers, NHL, Sports and tagged Andrew Hutchinson, Chad Kolarik, Connecticut Whale, Craig Weller, CTWhale, Dane Byers, Greg Moore, Jim Schoenfeld, Kelsey Tessier, Ken Gernander, National Hockey League, New York Ranger, New York Rangers, Scott Tanski, Wade Redden, Whale, XL Center. Bookmark the permalink.